This race will get you outside to enjoy a combination of trails and roads in Kentwood. This course is great for first-time runners but will also provide a challenge to more experienced runners. This race is perfect for running with your sweetie, soul mate, BFF or to meet someone new! Kids and families are welcome. The fastest runners will be awarded but so will the "best dressed." 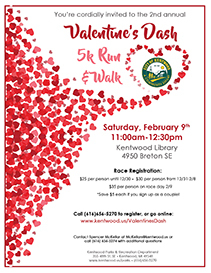 Those with the best Valentine themed costumes will be judged by their fellow runners to determine who is the "best dressed." Our race will have each mile marked, Valentine Candy stations, and an after party located in our Community Room at the Library.